For Christmas I received a Kindle Paperwhite (3rd Gen.) to replace the Kindle Touch I’d been using for the past few years. The improvement between the two devices was noticeable and for a couple of days I considered doing a review, but have now decided to take a slightly different track. My blog isn’t for reviewing gadgets, and there are plenty of other places you can get that. Instead, I’d like talk about my experience with e-readers over the years. When it comes to e-readers, I was a fairly early adopter. I have only owned 3 dedicated e-readers myself, however I have tried reading e-books on other devices so this will cover those as well even if they aren’t exclusively e-readers. Consider this a sort of documentary of the different devices I’ve used over time. I didn’t quite get in on the ground floor of the e-reader revolution, but I think I probably got in at the first point where the devices were starting to become good. That said, they were still fairly crude. They still relied on buttons for page turning, and had a simple keyboard at the bottom; basically a tablet that lacked the touch screen and used e-paper for the display. At the time I only jumped in because Amazon was pushing them, and I was facing the reality that I keep almost every book I buy. Finding shelf space had become massive pain. I was also interested in the prospect of being able to bring a large selection of books with me when I travel, instead of picking just two or three. 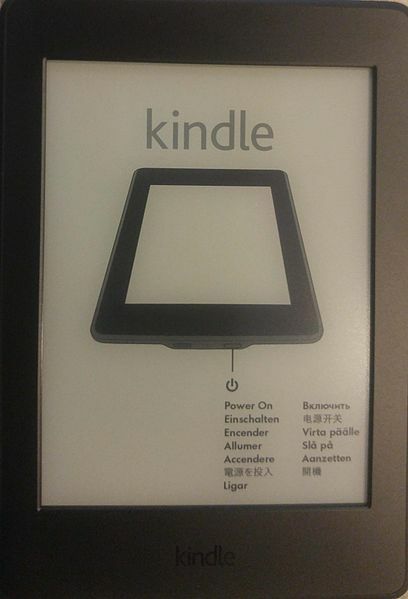 Before my purchase I actually looked at other e-readers that were coming to the market at around the same time. The whole e-book industry (and by extension e-reader industry) was still in its infancy—really it is still in the process of maturing despite how wide-spread it seems today. The only ones I seriously considered were made by Sony. I ended up passing on the Sony readers for two reasons: First, and most important, I was convinced that Amazon would have the better marketplace, and that using their own device would allow me to interact with it best. Second, the free 3G delivery of books seemed wonderfully convenient to me, especially as I didn’t have a wi-fi network at home and didn’t feel the need to deal with the device’s file structure to get books on it. Inelegant as the 2nd Gen. Kindle seems today, it completely sold me on e-readers. Reading on it was easy, and the device just seemed to vanish which allowed me to focus on the book. Battery life was great—even back then I could read almost constantly for 3 days before the charge started to get low. 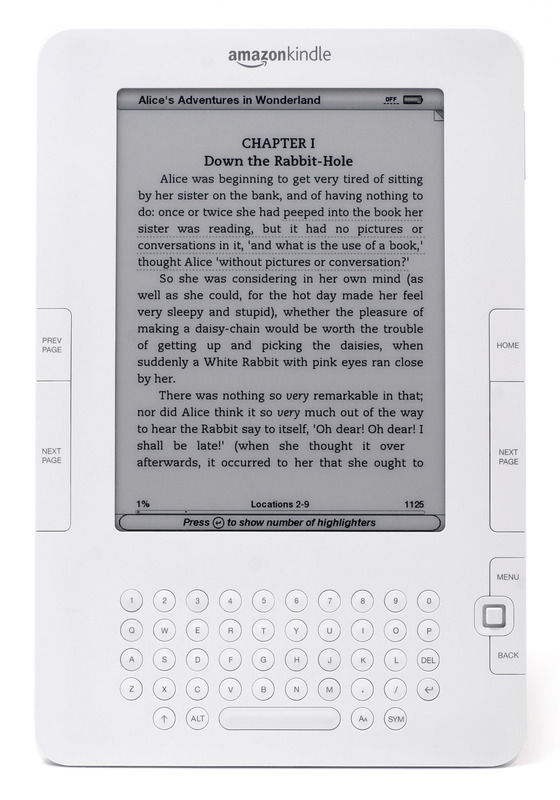 I thought an e-reader was a bit too pricey for most people to consider, and figured someone who reads a “normal” amount would probably prefer a tablet of some sort, but for someone who read as much as I did it was perfect. Ultimately, I ended up reading on it exclusively shortly after I got it. 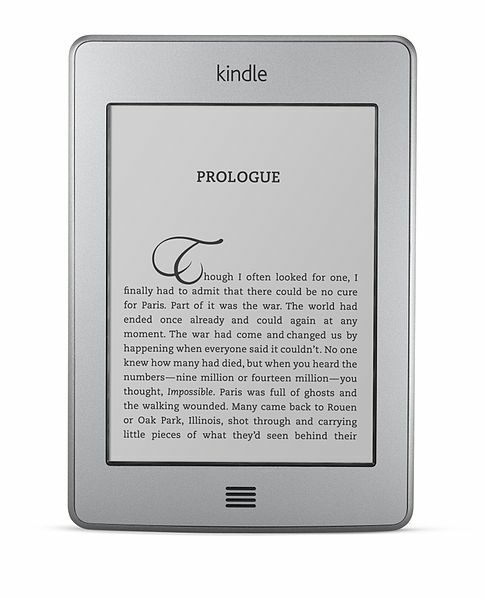 Within a few weeks of getting a 2nd Gen. Kindle I began to think about what features would improve it. At the top of that list was replacing the buttons with a touch screen. 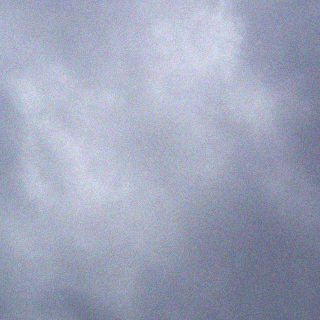 I figured this would let you either expand the size of the screen, or shrink the entire device (I didn’t actually care which was done). After the Kindle Touch was released it was a foregone conclusion that I was going to pounce on it. Although I found the gestures for interacting intuitive, early on this new kindle felt a little fiddly. Sometimes I’d accidentally turn pages without intending to do so. Over time this issue vanished (I am unsure if I got better at using the Kindle Touch or if there were software updates that improved the sensitivity). In addition, the storefront presented was more attractive and the display itself was crisper, with more contrast for the text. The version I got gave up free 3G delivery. At the time I wasn’t sure what to make of this, because it was one of the major features I had wanted in my previous Kindle. Ultimately it didn’t matter that much, to my surprise. By then I had wi-fi where I lived, and pretty much anywhere I went had wi-fi. If I was concerned about wi-fi access somewhere I could always plan ahead and buy books before my trip. The Kindle Touch immediately replaced my 2nd Gen. Kindle as my main reading device. It never ended up being my exclusive reader the way the previous Kindle had, but for any serious reading it was by far my favorite way to lose myself in a book. 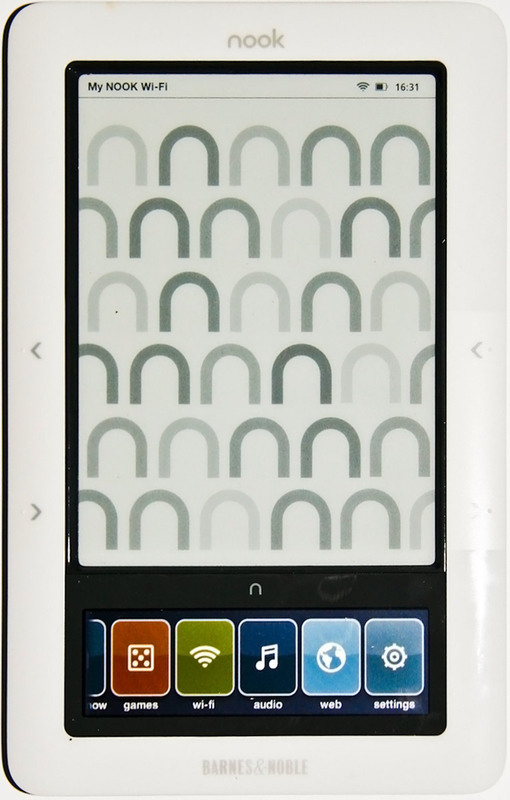 Barns & Noble Nook 1st Ed. At the time I got my Kindle Touch, my brother got a Nook. I didn’t get to use it much, but I did fiddle with it a little and quickly decided it wasn’t something I’d want. Of course, part of that was the knowledge that my growing Kindle library couldn’t easily follow me onto the Nook, but I also didn’t find the user interface particularly appealing. The miniature screen below the main display was an interesting innovation that tried to bring more utility, but to me it seemed like clutter. When I read something I don’t want there to be any distractions. I want it to be as much about the “page” before me as possible, even when I’m holding an electronic device. This is the point where I should stress that the Nook looked like a perfectly fine e-reader. I’ve heard some criticism about Barns & Noble’s e-book store, but my brother didn’t seem to have any difficulties. It’s completely possible that the reasons I didn’t like the device come down to personal preference and that I had already bought into the Kindle. I actually didn’t own my first laptop until after I got the Kindle Touch, mostly because I never saw the need for one when I had a desktop that was capable of everything I might want to do. Really the laptop I got was a move to start writing more seriously, and was a machine that would be dedicated to writing (mostly because it wouldn’t be powerful enough to run games). At some point I began to read on the laptop, though this was rarely by choice. I find having a back-lit screen hurts my eyes if I read on it for any significant length of time. The main reason I used it at all is that the Kindle is really tooled for .mobi files, and when it comes to PDF’s it isn’t good at displaying the document. That isn’t to say it can’t do it, just that I find the result distracting. So when I am required to read PDF files (and I do sometimes read things several hundred pages long that are PDF’s) I fall back on a laptop. I’ve tried using the kindle app for computers, and while I do think it works well and displays e-books beautifully, I vastly favor reading them on a kindle to this day. In short, while I do read with a Laptop it is restricted to a single file format. 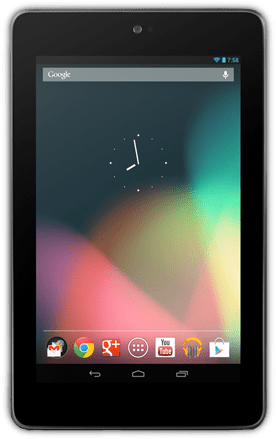 About a year after I got my first laptop I bought one of the first generation Nexus 7’s. This was more of an impulse buy on my part. I had been interested in tablets since the iPad came out, but the full-sized iPad just seemed unwieldy to me. If I wanted a screen that large I was going to be using my laptop or desktop. It was about the same size as my Kindle Touch, so I naturally decided to try it out as an e-reader. The experience wasn’t unpleasant. I still found the back-lit display a bit of a strain on my eyes, but I could turn the brightness down and there was the perk of being able to read when there wasn’t any light. For some reason it didn’t stick with me in that role, though. In the end it became a sort of day planner/note taker for me. If I had to guess, I would say that the more diverse nature of the tablet naturally lent itself to doing more with it…but this also detracted from making it a transparent device for reading. The Kindle, by contrast, is completely dedicated to reading. When I pick it up I know what I am going to be doing, and there isn’t any temptation to use it for anything else. Others probably don’t have this problem, but for me it was insurmountable. I owned a smart phone long before I got the Nexus, but I never actually tried reading with it until after I purchased the tablet. There isn’t much to say here beyond I didn’t find the experience particularly enjoyable. The small screen just turns me off, even on modern smart phones with larger screens. Maybe I’m just old, I know that reading on phones is becoming a big thing and completely get why. Since Smart Phones are so ubiquitous these days it is just convenient for people to read on one during their morning commute when they don’t want to have to carry something else. Unfortunately, that just isn’t a problem I have, although if I ever get into audio books I am sure the phone is what I would use. I know these have been out for a while, but the Kindle Touch has served me so well I didn’t want to replace it until recently. What finally gave me the push was getting my hands on a Paperwhite over Thanksgiving. My brother (the one who had previously owned a Nook) had been gifted a used one at some point and came to like it. I noticed him using it and tried it out for a bit, then quickly decided an upgrade was in order. Technically this was a gift (I merely dictated what I wanted), and to help keep the price down I chose to forego 3G once more. I also decided to include “special offers” which is marketing code for ads. It is the ads I most want to talk about. I had anticipated that Amazon would target the ads to me based on my purchase history, making them a way to help me discover new titles I might be interested in, but that doesn’t seem to be the case. For the record, I mostly read science fiction and fantasy. Most (all?) of the ads I’ve been served are for romance novels. Perhaps that is all that is being advertised. I’ve heard that romance is the largest genre in existence, but even if that is the case, you would think Amazon’s ability to collect data on what it’s customers buy would allow it to offer well targeted ads at bargain prices even if your target is a niche market. That said, the Paperwhite is a nice step forward. The side lighting overcomes the last drawback of my previous Kindles, allowing me to read even if the lights are out. The text is crisper, as I expected it would be. The UI works wonderfully, and the size of the device is perfect for use even with one hand. There are probably improvements that can be made, but by now they are likely just refinements.